With an easy pecan-and-date crust and tons of warm spices, these Gingerbread Cheesecake Bars highlight the holiday season’s warm flavors. We make these “cheesecake” bars with soaked cashews to replicate cheesecake’s creamy texture—no dairy or baking necessary. You won’t miss the dairy one bit in these gluten-free, vegan bars. Who wants a Gingerbread Cheesecake Bar?!  If your hand is as high as mine is right now, you’re going to want to make these. I’m a huge fan of the flavors that come along during the holidays. I like to put cinnamon, nutmeg, and all the warm spices in my treats all year round, but this time of the year I can really go for it. For drinking, I love sipping on a homemade vegan chai latte. 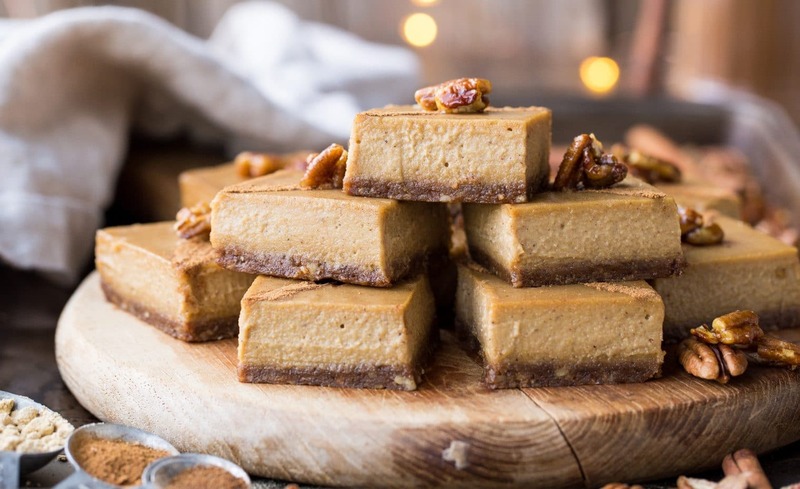 But when it comes dessert, it does not get better than these vegan gingerbread cheesecake bars. 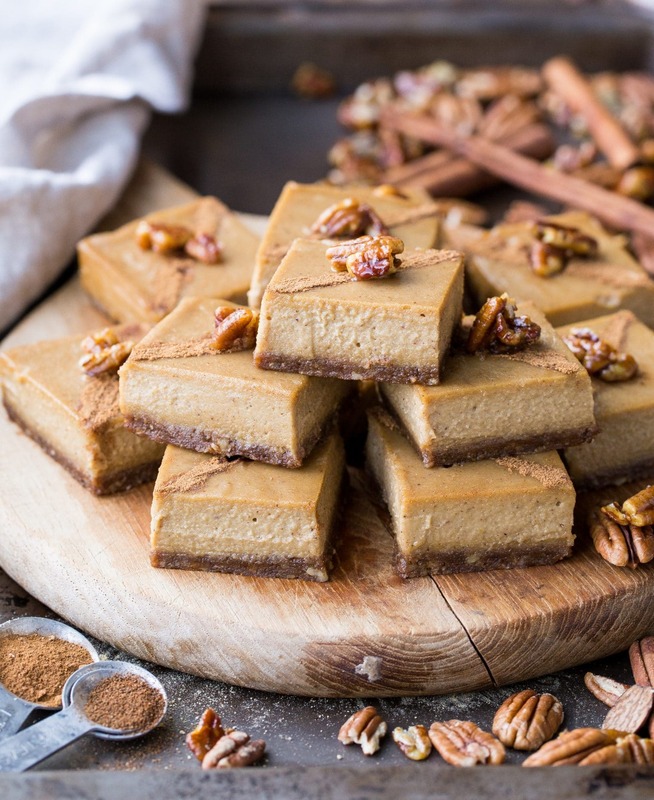 These Gingerbread Cheesecake Bars are perfect for the holidays! These Gingerbread Cheesecake Bars are the epitome of an incredible holiday dessert. They’re creamy and sweet, with all of the flavors that I love about this season. 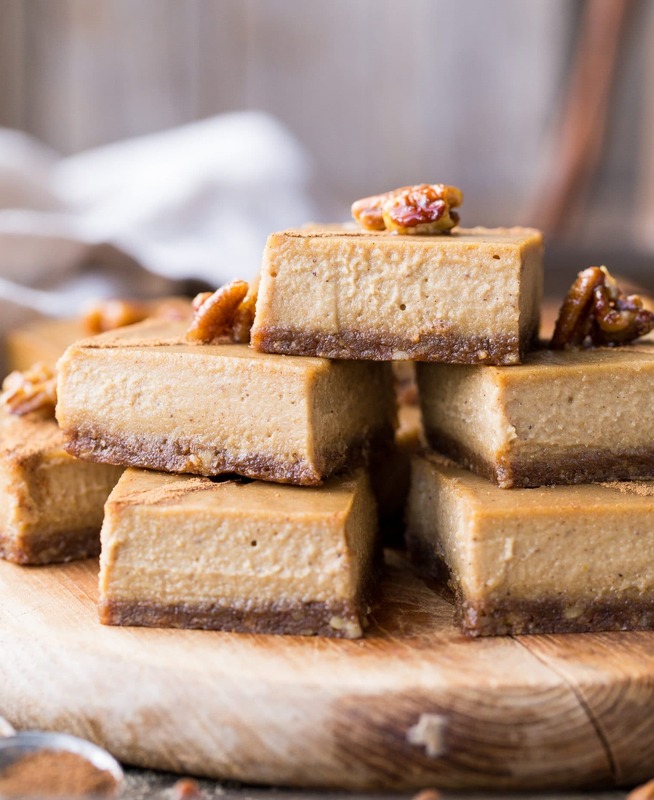 They are similar to many of my paleo and vegan cheesecakes in that the cheesecake is made from raw cashews. After soaking the cashews in water for a few hours, they blend into a texture which replicates that lusciously creamy cheesecake texture. Maple syrup sweetens these Gingerbread Cheesecake Bars, which adds a subtle sweetness. It also enhances the cinnamon, nutmeg, ginger, and cloves that flavor the cheesecake. We incorporate unsulphured molasses into the bars, which gives a rich flavor that brings all things holiday-season to mind. And it tastes like a gingerbread cookie transformed into a magically creamy dessert! We recreate the tang of classic cheesecake with a hint of lemon juice and zest, which also enhances the gingerbread flavor and adds some brightness. We make a crust out of dates, pecans, cinnamon, ginger, and salt. It’s a simple combination, but it works so well with the flavors in this dessert. 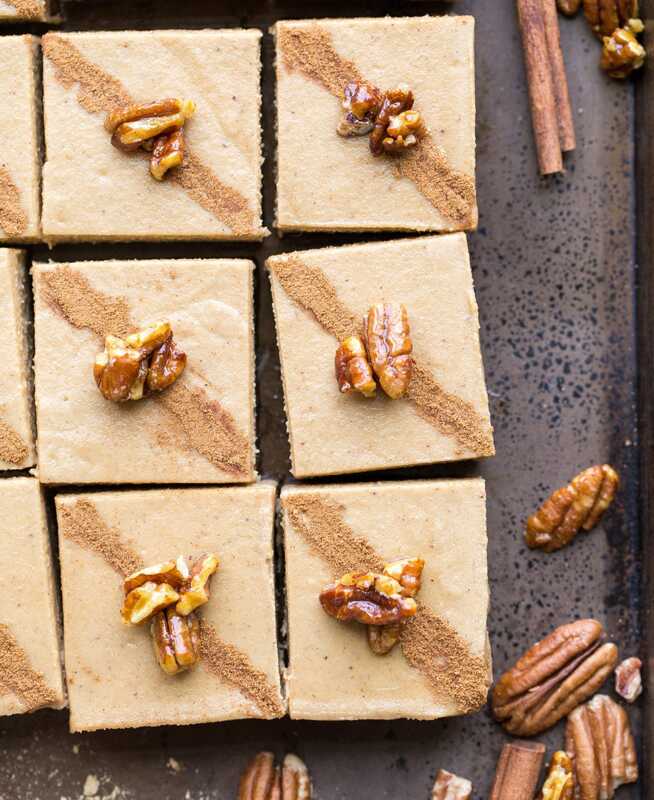 If you’re a fan of gingerbread…you’re going to love these vegan gingerbread cheesecake bars. Enjoy!! No need to free up oven space for these Gingerbread Cheesecake Bars. These “cheesecake” bars are made with soaked cashews to replicate cheesecake’s creamy texture—no dairy or baking necessary. With an easy pecan-and-date crust and tons of warm spices, these Gingerbread Cheesecake Bars are packed with the holiday season’s warm flavors. You won’t miss the dairy one bit in these gluten-free, vegan bars. In the work bowl of a food processor, place dates. Pulse until finely chopped. Add pecans, ground ginger, cinnamon, and salt; pulse on medium-low speed until a sticky dough begins to forms, with small pecan bits remaining. (Do not overprocess or the dough will become oily.) Press dough into the bottom of prepared pan. Drain soaked cashews, and rinse with cold water. In the container of a blender, combine cashews, coconut milk, maple syrup, melted coconut oil, molasses, lemon zest and juice, vanilla, nutmeg, cloves, 1½ teaspoons ginger, 1 teaspoon cinnamon, and ¼ teaspoon salt; blend until mixture is silky smooth and creamy, 2 to 3 minutes. Taste and adjust seasonings, if desired. Pour filling into prepared crust, smoothing top with an offset spatula. Tap pan on the counter a few times to release any air bubbles. Freeze until completely firm, at least 3 hours. When the cheesecake bars are set, run a knife under hot water to warm it up before cutting bars with the still-hot (dried) knife. Cut into 16 squares. Garnish with cinnamon, nutmeg, and pecan halves, if desired. Let thaw at room temperature for 10 to 15 minutes before serving. Refrigerate in an airtight container for up to 2 weeks, or freeze for up to 2 months. This recipe was originally printed in the 2017 Holiday Issue of Bake From Scratch Magazine! Warm flavors are my absolute favorite. I love cooking this time of year and the fact that you used maple syrup to sweeten these is so good. I can’t wait to give these a try! Is this fancy molasses that you’re using or can I use my blackstrap molasses ? Haha, is there such thing as fancy molasses?! I use regular blackstrap molasses! Do you have nutrition info on these? I’m wondering how much sugar per serving there is. Thanks! Hi Becky, I don’t but you can calculate it on myfitnesspal.com! I’d really appreciate it if you would use a typeface that is bolder and easier to read. Hi Susan – if you have Google Chrome, you can always zoom in (view –> zoom in, OR press command+) to make the text bigger! I love cheesecakes… I love gingerbreads… It seems amazing… as usual ! Thank you so much Rachel !